Chances are, stretching isn’t included in your daily routine. Whether you run out of time, don’t feel you have sufficient twinges to warrant downing tools and testing flexibility, or simply don’t have the know-how to lengthen everything out after a busy day, squeezing in some body TLC is more important than you realise. Stretching can improve your range of movement and mobility if practised regularly. Stretching can help to improve posture. Muscle groups such as hamstrings and those found around the chest can get progressively tighter by being forced into the same position for hours on end, as is often the case after a day at the desk. Stretching these muscles out regularly can help to counteract some of the effects of those hours spent sitting. Stretching can help to reduce the risk of injury and alleviate certain injuries (such as lower back pain), particularly if lack of flexibility is an issue in the surrounding muscles. Stretching can be very relaxing! Unlike your cardio or strength routine, there is no real burn involved with stretching so it’s a perfect time to sit (or lie) back and focus on breathing deeply, allowing tension to disperse and collect your thoughts for the day. Spend 5-10 minutes warming up before stretching to increase blood flow to the muscle before you stretch – this could be something as simple as a short walk or taking a few flights of stairs. This neck stretch can be performed seated or standing and is a great way to ease built up neck tension from a day at your computer. 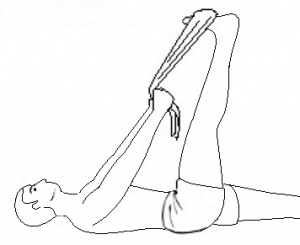 This can help to ease tension that builds up in hip and thigh muscles over the course of the day. Keeping these muscles flexible may help to keep both knee and back pain at bay. 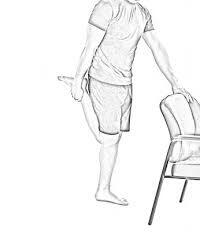 Example: From a standing position, using a wall or door for support if needed, bend your right leg, grab the top of your right foot towards your right buttock, knee pointing down at the floor. You should feel a stretch right down the front of your right thigh. Tilt hips forward to feel the stretch at the top of your thigh. Hold for 20-30 seconds. Switch to left leg. 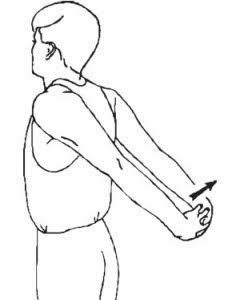 This chest stretch is one of the easiest ways to stretch out your chest muscles which can get tight and overworked if you spend a lot of time seated or on devices, and can contribute to poor posture. This is a great little stretch to do at the end of the day. It’s good for stretching out both upper and lower back and subtly works your core muscle too. 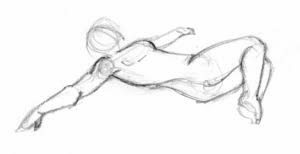 Example: Begin in an all fours position with back flat before rounding spine and arching back your back and dropping chin to chest. Gently contract your abdominals as you do this taking care not to hold your breath. Hold for five seconds, relax and repeat. Do a total of five arches. A lying hamstrings stretch is a great way to stretch out backs of legs and a chance to lie down at the same time! Maintaining flexibility in the hamstrings is important, particularly if you’re active and/or deskbound as tight hamstrings can place additional stress on the lower back, aggravating or even causing lower back pain. Example: Lie on the floor with both legs bent and wrap a resistance band, or a scarf or towel, around the base of one foot (your other foot should remain on the floor). Slowly extend your leg upwards and aim to reach a right angle – you should feel a stretch but no pain. Once you feel a decent stretch, hold for 30 seconds before repeating on the other side. A good glute (buttock) stretch shouldn’t be overlooked either – this can also help to ease any hip or lower back stiffness. Example: Lie on your back with legs bent, feet flat on the floor. Lift your legs off the floor and cross your right leg over the thigh, above your knee, of your left leg. Pull your left thigh and push your right foot (keep your right foot straight) towards you until you feel a stretch in your right buttock. Hold for 30 seconds. Repeat on other side. Finish your stretching sequence with the dreamy hip roll exercise. More of a mobility exercise, the hip roll also stretches out muscles around the hips, lower back and chest. 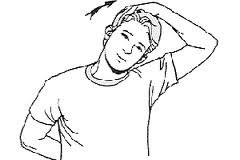 Example: Lie on your back with legs bent at the knee, feet flat, arms out to the side. Roll your hips and legs to the right, keeping feet flat on floor, as you roll head to the left. Hold for a count of three seconds, before returning to centre and repeating on the other side. Perform a total of 10 rolls. Back Pain – it’s not the end of the world – here’s why…..
DBC Naas Physiotherapy & Sports Injury Clinic was established by Mary O’Connor in 1990. Our highly qualified, experienced and trusted Chartered Physiotherapists provide you with world class assessment, treatment and rehabilitation programmes for back pain, neck pain and sports injuries in our state of the art facilities.